The Feminist Revolution: The Struggle for Women’s Liberation offers a panoramic view of women’s fight for equal rights during the late twentieth century, as it’s never been presented before. Informed by a wealth of original interviews and previously unpublished accounts, the world of women’s liberation movements is illustrated with rare and stunning images that show the creativity and diversity of feminist struggles. This is a timely and brilliant tribute to the audacious spirit of women’s liberation movements, which offers renewed inspiration for the future. BONNIE J. MORRIS was a professor at both George Washington University and Georgetown, and now teaches women’s history at Berkeley and Stanford. She is the author of fifteen books and lectures widely on the women’s music movement. DR. DEBORAH M. WITHERS is one of the UK’s most respected proponents of women’s cultural history. 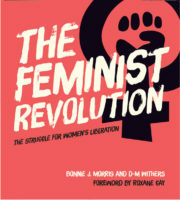 D-M has curated numerous major exhibitions on the women’s movement, including the leading Sistershow Revisited and Music & Liberation, and has written widely on the subject. A past lecturer at Bristol University, D-M is now Research Fellow at the University of Sussex/British Library, working on the Virago papers.